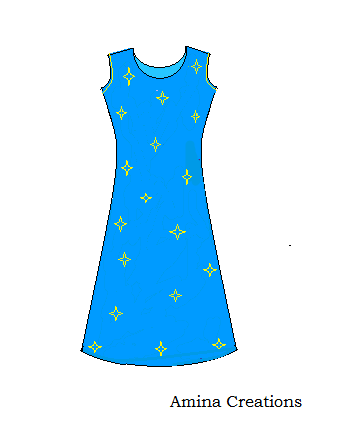 For a sleeveless kameez or kurti, the arm hole is not cut deep and usually piping is done to finish the edges. 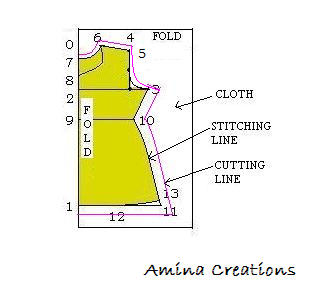 The construction and method of stitching a sleeveless kameez is discussed below. Join 3 to 5 through a curve as shown to get the arm hole and 6 to 8 through a curve to get the front neck and 6 to 7 through a curve to get the back neck. Join 6 to 5 for the shoulder and 12 to 13 as shown. For stitching a sleeveless top, measure and note down the body measurements. Then take the cloth, open it in the reverse such that the two selvedges of the cloth are on top of each other. Then fold again such that the two ends are on top of each other. Then leaving 1” extra cloth along the sides and bottom of the dress and ½” extra cloth along the neck, shoulder and arm hole, cut the cloth. Remember that the front and back necks have to be cut separately because their curves are different. Hence take care while cutting it. Most importantly the shoulder line of all the four pieces must be equal. Begin by first stitching at the shoulders and finish the neck. For this refer FINISHING THE NECK. Then do piping with a cloth of the same or contrasting colour and stitch the sides. Leave a small opening at the two sides if required and finish it. Refer STITCHING THE SIDES for details. Finally double fold the extra cloth at the ends and stitch on top. Your sleeveless top is now ready. 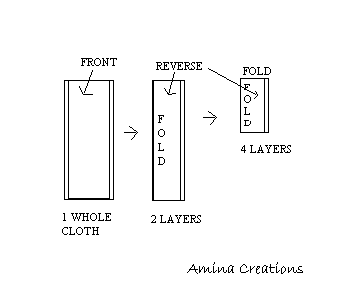 Hello Aminaji, I made a Sleeveless kurti using the above guidelines provided on your website. The dress was perfect, also all my doubts were clarified. I have a request, please make a chart "How to draft Deep Back Kurti and Blouse" providing details of reducing shoulder and armhole length. Hi Shweta Gupta, thanks for your comment.. Will post a tutorial soon..